Nine Florida hospitals and one ambulance company have agreed to pay the federal government a total of $7.5 million to settle allegations that they defrauded Medicare by billing for unnecessary ambulance rides. Four of the hospitals were owned by HCA Holdings, Inc., and four were owned by Baptist Health. The other was UF Health Jacksonville. Despite the settlement, all nine hospitals denied any wrongdoing. The settlement was reached following a four-year investigation by the US attorney's office for the middle district of Florida. According to The Wall Street Journal, the attorney's office accused the hospitals of transporting patients that did not need emergency care via ambulance to and from their homes or nursing homes when instead, they should have been picked up by taxi, friends or relatives or, when necessary a wheelchair van. Although none of the hospitals profited directly from the ambulance rides, prosecutors argued that they benefited financially from quicker discharges and admissions. Federal prosecutors told The Wall Street Journal that this case could have national implications "because hospitals around the country often rely on ambulances to ferry patients to and from their facilities, at times with little regard for the cost or medical need." Under Medicare, ambulance services are deemed medically necessary "if they are furnished to a beneficiary whose medical condition is such that other means of transportation are contraindicated. In any case in which some means of transportation other than an ambulance could be used without endangering the individual's health, whether or not such other transportation is actually available, no payment may be made for ambulance services." Brian Mahany, healthcare fraud expert and whistleblower claims lawyer, says at the beginning of this year, the Centers for Medicare and Medicaid Services announced that they were doing a crackdown on emergency medical services; included therein is a major push on ambulance companies that are overbilling Medicare or otherwise committing Medicare fraud. "Toward that end, companies have been charged with healthcare fraud all along the eastern seaboard from New Jersey to Florida as part of that initiative," he says. Mahany says in addition to transferring non-emergent patients from their hospitals to their homes or nursing homes, ambulance companies have been found transferring ambulatory dialysis patients via ambulance, falsifying level of care and in some cases, working with hospitals where they are given kickbacks to bypass closer hospitals. "Whistleblowers are coming forward to report this fraud," he says. "Their incentive is that they receive 10% to 30% of all fines and monies recovered as a cash reward." In order for a patient to be transported by ambulance, a nurse or a physician needs to sign a certification of medical need or necessity. 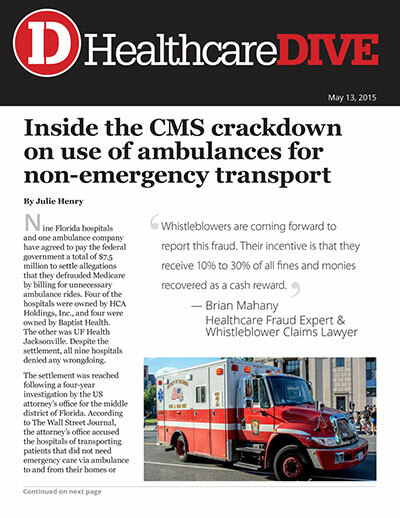 "I think in a lot of cases, people are just signing what the ambulance company puts in front of them and are unwittingly allowing them to defraud Medicare, in which case the hospital can be charged, too," says Mahany. "Hospital administrators need to make sure the people who are signing these forms know what they're signing and understand the significance. If someone is ambulatory, you can't sign a piece of paper authorizing an ambulance transport."